Love Week in honour of St. Valentine’s Day: special menus for the most romantic week of the year. It feels like only yesterday that we were launching the summer party season with Mark Knight. And in the blink of an eye it’s September and there’s just a month left to enjoy the incredible beach parties at Monkey Beach, and end the season in style at our closing event. Come and see what’s in store! One for the road before Closing Party! It´s back to hell again this summer with our Inferno event on Sunday 4th September. 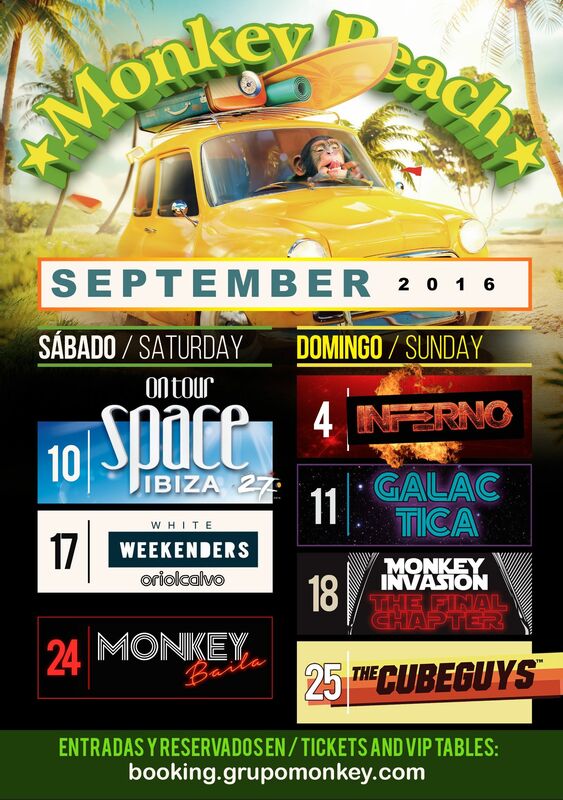 On Saturday 10th, Space Ibiza On Tour comes to town. After 27 years, the famous Ibizan nightclub closes their doors for the last time in October and is heading for the legendary party at Monkey Beach with resident DJ, Javi Bora. We’l be having more friends to visit on 11th September too. September draws to a close with a new ‘latin’ night, so bring your best moves…. and don’t miss The Cube Guys on Sunday 25th September. The end is in sight….